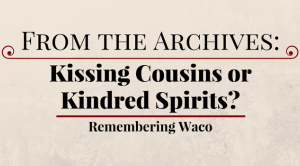 Kissing Cousins or Kindred Spirits? Editor’s Note: This year marks the 25th anniversary of the Waco Siege that occurred from February 28 to April 19, 1993. Throughout the weeks, we have been sharing on the website the articles that appeared in the May 1993 edition (vol. 23, no. 1) of Spectrum concerning this tragedy. Seventh-day Adventist image makers rushed to assemble press kits, complete with family tree genealogies that identified the occupants of Ranch Apocalypse as mere kissing cousins. A tree trunk labeled Christian was hastily drawn boasting a Protestant arm, a millennial movement branch, and relatively young Adventist shoots that include the Seventh-day Adventists. Fully two forks down from this Seventh-day Adventist shoot are the Branch Davidians. Reformed twice. Second or third cousins at best. Shirttail relatives only. And by marriage. Perhaps. Seventh-day Adventists join with those of all faiths—and those of no proclaimed faith—who are profoundly repelled by the fundamentalist ingredients that fueled the fire of Ranch Apocalypse. Such ingredients include a literalist approach to Scripture, the assumption of unquestioned authority on the part of congregants, the exclusive withdrawal from ongoing history, the substitution of eschatological fantasy for present reality, and the enforcement of rigid behavioral proscriptions—with the community's leadership allegedly not being bound by key proscribed behavioral norms. Are we appalled by these traits because they are so foreign to our lived experience—aberrations characteristic of no one in our circle closer than kissing cousins? Or are we appalled because David Koresh's reading of the Apocalypse, charting of eschatological events, listing of behavioral demands, and assumption of authoritative rule elicit strong identification buried deep within our collective soul? Koresh, as with William Miller and a great cloud of Adventist witnesses, engages in a biblical interpretation that observers past and present characterize as "wooden literalism." Comparing scripture line upon line and precept upon precept with less than a clear regard for historical context and using a (non) method that "lets the Bible serve as its own interpreter" leads inevitably to alarming consequences. Koresh becomes, in effect, the keeper of the text. Keepers of the text who employ this woodenly literal hermeneutic begin "helping" the Bible interpret itself—unfettered by accountability to established norms of responsible reading. Quickly, leaders find themselves and their communities explicitly identified in the text. The adage that "power corrupts, and absolute power corrupts absolutely" is particularly instructive when applied to biblical interpretation. Those interpreters who call others to embrace this fundamentalist grid—be they fundamentalist Catholics, Baptists, Seventh-day Adventists, Branch Davidians, Jonestown recruits, followers of Khomeini, or members of the Charles Manson family—achieve power and authority by promulgating a law of literalism. Everything, even the most obscure formulae, symbols, and numbers, must be unlocked. Such definition leads inevitably to absolute authority of the interpreters and the demand for absolute obedience by the flock. Biblical authority corrupts and absolute authority corrupts absolutely. In apocalyptic literature, prophecy goes into overdrive and symbolic language abounds in cosmic proportions. Readers and hearers of apocalyptic are hurled through time and space as they journey into the heavenly and earthly and subterranean spheres while piecing together fragments of humankind's shared story. Divine and demonic symbols of the great controversy between light and darkness flash larger than life on the screen of universal history. Beasts rampage and nations give obeisance. Harlots seduce and populations succumb. Winds blow and the earth shakes. Bowls are poured out and history screams. Woes are flung against space and the universe is hushed. In such a context, literalists, absolutists, and would-be demagogues have a field day. Give or take a symbol or two, such games are harmless enough. Bruised limbs and egos can heal. But when apocalyptic interpreters presume to label entire religious faiths as Babylon, while at the same time identifying their own community as constituting God's True Remnant, the ground is laid for the sins of triumphalism, exclusivism, and pride. The abuse of authority blooms to full flower. Stir in a paranoid mindset that comes to anticipate—indeed invite—persecution at the hands of those branded as Babylonian whores and fornicating daughters of whores, and a self-fulfilling prophecy of destruction is set in motion. Make no mistake: when Seventh-day Adventists heard Koresh's impassioned and detailed interpretations of the Apocalypse, we heard our shared history. Many of us were frightened by what we heard. The fundamentalist law of literalism, abuse of authority, exclusive triumphalism, sensationalist eschatology, paranoid suspicions of persecution, and sectarian withdrawal from history need not carry the day when dealing with the apocalyptic. We have another option. The Apocalypse is not merely a puzzle to be pieced together or a chronology to be calculated, not a mathematical formula or historical secret, but a liberating discovery. Revelation is a magnificent hymn of praise to be celebrated. The Apocalypse affirms the good news that the Kingdom will triumph! The baby wins over the beast. The woman with child wins over the harlot. Faithful remnants endure as unrighteous Babylons crumble. Shouts of Alleluia! replace woes that have been poured out upon abusive systems. The lamb emerges as Lord of history. Whether the occupants at Ranch Apocalypse were indeed kissing cousins cannot be answered once and for all. What can be affirmed is that the cosmic family tree pictured in the final chapters of the Apocalypse shades a great and diverse multitude, and that leaves from its many branches are a balm for the healing of the nations. Ellen White describes the boughs of this tree hanging over the walls of the heavenly city, encompassing the present order. No wooden literalism in this symbolic interpretation. No substitution of present reality for otherworldly escapism. Rather, individuals motivated by this image of the family tree are called to become engaged in their world as agents of healing, justice, and reconciliation. Let us—who have ears to hear—listen to what the Spirit says to the churches. This article was written by Charles Teel for the May 1993 issue of Spectrum. Very good, but long read. I found myself agreeing with the author in many ways (perhaps most or all, depending if I understoood the author correctly). Adventism has many voices indeed! And many of us argue and fight about things - the Bible, what Jesus said or meant in his teachings and actions, Jewish history/history of the Bible, the spiritual and religious movement right after Jesus lived and died, and rose again and went to Heaven. Today we argue about Bible versions and translations, the ordination of women, which church organization has the truth, [and it seems we also argue about the] organized church vs church members. It seems that in today’s society among Adventist faith we misunderstand and argue about everything. Is it any wonder that David Koresh (forgive any of my misspellings; I am not able to spell check while I type this Reply) and his group misheard or misinterpreted the [organized] church or its members? Is it any wonder we [as the church] have ostracized those who think outside the box [like Dr Desmond Ford]? Perhaps we are forgetting a fundamental fact that we are to be striving for unity, for connection (not a loose connection, but a real and vibrant one, one that’s full of life and inspiration). When will we realize that the Tree of Knowledge has grown [inside our heads] very large indeed… and that we are eating lies… just as Adam and Eve did. And we live in dysfunction, outside of God’s original plan because we continue to eat from that Tree. The fruit of that tree has proven bitter to us in the long run. In a world of words, have we forgotten that words only describe reality, and that my view is different then yours and forever will be? Meanings of words and phrases are always in perpetual change… and to try and fight with words against one another is futile.